New Delhi : India is providing an intriguing opportunity to international investors at this juncture. Strong economic growth and an improvement in the business environment have gotten overseas businesses interested in the country. However, investing in the country comes along with a set of challenges which has continuously deterred a higher influx of money from abroad. Some of it is related to public finances, represented by fiscal and current account deficits – factors which are cited by major credit rating agencies as important reasons for India’s low credit rating. Then there are more broad-ranging aspects related to investor perception and experience. AT Kearney, a consultancy, had outlined some of these in a survey of investors conducted in its 2017 Foreign Direct Investment (FDI) Confidence Index. The regulatory environment and prevalent corruption were cited as the main reasons dissuading foreign investors from investing in India. Lengthy procedures and a difficult legal process also work as barriers to entry. Neighboring China has its own set of problems when it comes to attracting foreign investments. However, it has remained quite a popular investment destination beyond the developed world while India has remained on the sidelines. A major reason for that has been the relatively poor infrastructure setup in India. The transport and electricity infrastructure are big roadblocks to higher foreign investments. They provide substantial reasons for investors preferring China over India. 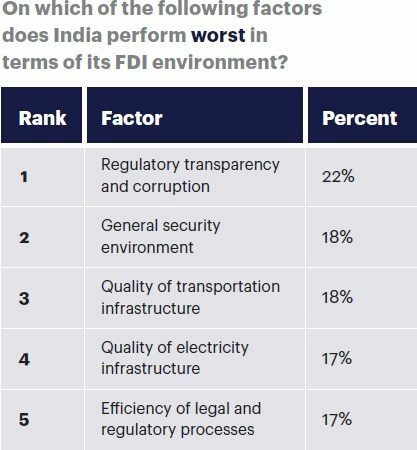 The AT Kearney survey found out that 49% of the investors thought that at present, China’s investment environment is better, while 45% thought that India is better suited for FDI flows. India has been making some strides in improving its investment environment. The demonetization move by the government, apart from improvement in the tax reporting structure, has been intended to reduce instances of corruption and increase government revenue. A major tax reform that can uplift investor sentiment is the Goods and Services Tax (GST) which is slated to come into effect from July 1, 2017 and intends to create a common market in terms of taxation. Investors believe that the infrastructure bottlenecks can also be improved as they are under the direct control of the government. 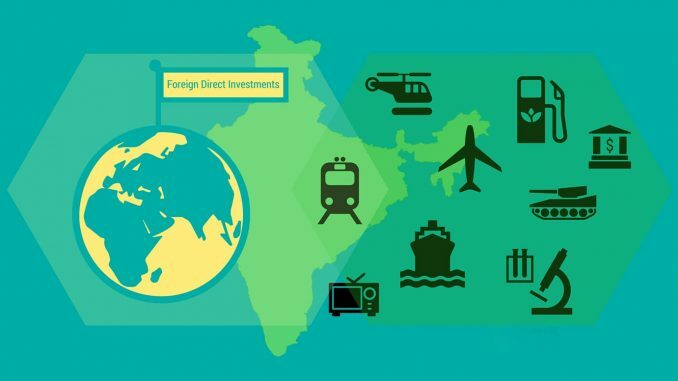 Thus, in terms of an overall assessment, overseas investors are finding India fascinating when it comes to doing long-term business, and given that the government will continue on its reform agenda, FDI flows to the country are on track for a rise.